People often ask us about the best way to enclose an outdoor space without loosing the ‘outdoors’. There are many options that Outside Concepts Sutherland can advise you on but one of the most effective and popular solutions to the ‘indoor outdoor’ dilemma is to install outdoor blinds in your patio or pergola area. The best thing about outdoor blinds is that they allow you control the ‘microclimate’ of your deck or patio. 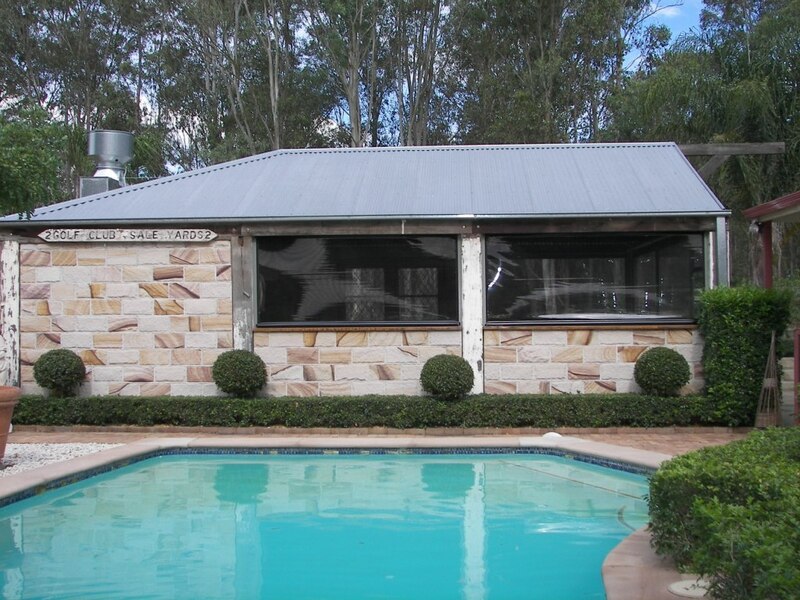 They can give you extended use of your entertainment area throughout the year by providing complete or partial block out from hot sun, protecting you from cold winds and waterproofing the area. Additionally, outdoor blinds provide privacy from neighbours and filter views that may not be pleasing. Outdoor blinds, also known more generically as ‘cafe blinds’ come in a range of models and fabrics. 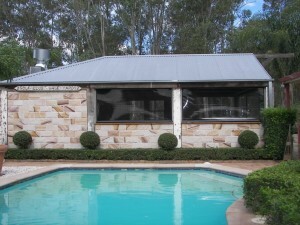 Outside Concepts supports Pinz blinds, an Australian company based in South Australia. All their blinds are custom made to fit across long spans as well as to doorway specifications. They can be mounted under pelmets for a modern streamlined look or exposed so that the rolled blinds are located neatly at the top the opening. There are a number of sophisticated models available including the popular Ziptrak model featured in the above photo. Ziptrak uses a unique and reliable slotted track system allowing the blinds slide up and down and stopping anywhere where you want. They can also be motorised for ultimate control. While outdoor blinds can easily be measured and installed to fit most existing spaces, if you are building a new deck or pergola and the budget is an issue, consider designing the area to accommodate outdoor blinds in the future. Why not ask Outside Concepts for a quote today and enjoy a perfect indoor, outdoor area with complete control of your climate!